IRVINE, CA (US), September 2018 — Researchers from the University of California, Irvine have identified intrinsic cell properties that influence the fate of neural stem cells, affecting what type of brain cell they will form: neurons, astrocytes or oligodendrocytes. This discovery could give scientists a new way to predict or control the fate of stem cells, improving their use in transplantation therapies. The study, led by Lisa A. Flanagan, Ph.D., an associate professor of neurology at UCI School of Medicine, revealed that neural stem cells differing in fate potential expressed distinct patterns of sugars on the cell surface. These sugars contribute to neural stem cell membrane electrical properties and ultimately cell fate. "Stem cells hold great promise for treating disease, but it can be difficult to tell what a stem cell will become after it has been transplanted," said Dr. Flanagan. "We can transplant the same number of stem cells in one patient as in another, but the outcomes will be significantly different if the transplanted cells in the first patient become neurons and those in the second patient become astrocytes. “With this new discovery, we will be able to predict what a neural stem cell will become and possibly direct cell fate, which will greatly enhance the success of stem cell transplant therapies for a wide variety of diseases." In research initially published in 2008, Dr. Flanagan and colleagues discovered a new way to identify and sort neural stem cells that have different fates by using cell electrical properties. They now build on these findings by showing that differences in cell surface sugars are the reason that the cells have different electrical properties. 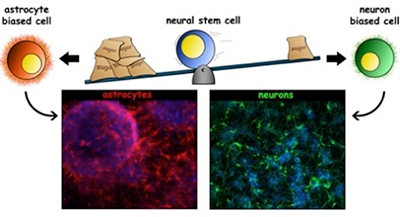 In this latest study, published recently in Stem Cell Reports, researchers examined several pathways that add sugars to cells and found one that differed between cells that make neurons and those making astrocytes. They stimulated this pathway in neural stem cells, changed cell electrical properties and caused them to make more astrocytes and fewer neurons, showing that cell surface sugars can control fate. The pathway is active in cells grown for transplants and in cells of the developing brain, so this pathway may also control how neural stem cells form neurons and astrocytes when the brain is being formed during development. The team is now testing whether modifying this pathway changes how cells behave in transplants or how the developing brain is formed. They are focusing on the machinery inside the cell that adds the sugars in the first place, to see how the process is regulated. They also are finding that particular proteins on the cell surface are changed by this pathway, which will help to uncover how the sugars are telling stem cells which type of cell to form. The long-term goal of these studies is to find ways to improve the effectiveness of stem cell transplants to treat injury and disease. The research team examined several pathways that add sugars to cells and found one that differed between cells that make neurons and those making astrocytes. They stimulated this pathway in neural stem cells, changed cell electrical properties, and caused them to make more astrocytes and fewer neurons, showing that cell surface sugars can control fate. The pathway is active in cells grown for transplants and in cells of the developing brain, so this pathway may also control how neural stem cells form neurons and astrocytes when the brain is being formed during development. Image courtesy of Lisa Flanagan/UCI School of Medicine.